Last issue, The Naval Architect touched upon the news of plans for a collaboration between maritime software leader, NAPA, and Japanese software development and engineering experts, NTT Data Engineering Systems (NDES). The project aims to significantly reduce costs associated with the design and production of ships, by improving compatibility between the companies’ respective software programmes. NAPA’s software, NAPA Steel, is currently used by shipyards and ship designers in the structural design of vessels. By utilising a 3D model from the very start of the design process, it has proved a popular choice with companies around the world for its enhanced accuracy and ability to increase productivity. NDES’ offering, Beagle, which has a large user base in Japan, is a 3D ship structure viewing software that is used for production planning and design review, focussing on areas such as assembly sequence study, painting and welding length calculation per production stage. 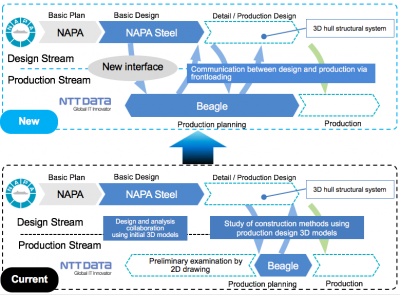 Both companies aim to link the two software programmes so that 3D design data created in NAPA Steel can be used to create visualisations in Beagle, therefore presenting the opportunity to review production plans in the early stages of design rather than later in the design process, as is currently common practice. At present, users are able to study production in Beagle with data created using 3D-CAD tools, but this is only possible once the proposed project has reached the production design stage. Speaking with The Naval Architect, Hulkkonen elaborates on the most significant benefits ship designers and yards could see from this collaboration: “The main benefit here is that this allows earlier, closer collaboration between early stage design and the production planning and review processes. “During the early stage design process, production review has been only possible using 2D drawings. Separate production design 3D models have traditionally only been created during later design phases for manufacturing purposes — the same models that are used for production planning purposes. Because of the late introduction of these models, review at the initial stages has been time consuming and difficult. Rather than creating a single integrated platform, NAPA wants to “ensure that the latest 3D ship design technology can be leveraged as widely as possible” and so will continue to develop similar interfaces with other software providers, Hulkkonen concludes.